When a person makes a call on a cell phone, the device sends and receives radio frequency (RF) signals between its own antenna and the nearest cell tower. If there’s a strong signal, making a call is no problem. But when that signal is somehow weakened or blocked, then poor reception, low signal quality, and dropped calls are a common result. A cell phone signal booster can provide a safe, reliable solution to these signal issues. However, there are some troubleshooting practices to be aware of. If you’re an installer or reseller, take some time to familiarize yourself with issues like oscillation and overload, and learn how to recognize and respond to reports of these conditions so you can be prepared in the future. One potential problem when installing a cellular signal booster (also called an amplifier) is a condition known as oscillation or feedback. This happens when the outside antenna (or donor antenna) and the inside antenna (or broadcast antenna) are too close to one another. Their proximity allows “crosstalk” between the two antennas, which causes a feedback loop, or oscillation condition. This condition can potentially damage the cellular signal boosting system and even disrupt the cellular network. That’s why the Federal Communications Commission (FCC) requires all cell signal boosters to auto-detect oscillation, and immediately reduce power or shut down to correct the condition. If you see a solid red light on the amplifier, you’ll know that oscillation has occurred and the signal booster has reduced power or shut down. Find out more about the signal in your building with a site survey. The first step in fixing oscillation is to increase antenna isolation. You can do this by putting more space between the outside (donor) antenna and the inside (broadcast) antenna. If possible, move the broadcast antenna to another part of the room or another room in the building. Depending on the booster model, you may be able to use the adjustable knobs to turn down the gain on the amplifier unit. This limits the amplifier’s ability to boost the signal, which can help reduce feedback. But be aware that reducing a booster’s gain may also reduce the indoor coverage area of the amplified signal. Another problem can occur if a donor antenna on the outside of a building is too close to a cell tower, making the incoming signal too strong and resulting in signal overload. This condition can happen with any carrier’s tower, whether you are trying to amplify signal from that tower or not. Overload is typically indicated by a blinking orange light on the amplifier. First, the best course of action is to redirect the donor antenna. If it’s a directional antenna, aim the antenna away from the offending cell tower until the lights on the booster change back to green. You can also move the outside antenna to a different location, such as on the roof or the side of the building where it is shielded from the cell tower. However, sometimes redirecting the donor antenna won’t work. For example, if your customer is using AT&T cell phone service, you aim the donor antenna at the nearest AT&T tower. However, there might be a Verizon tower located between the AT&T tower and the building, which is overpowering the booster with its Verizon signal. If you redirect the antenna, you’ll lose connection with the distant AT&T tower. Yet, because the Verizon tower is so close, the booster experiences signal overload and shuts itself down. Frequency filters are a logical answer to a problem like the one described above with competing towers. Filters are easy to install with multiple options for whichever frequency range is causing the overload problem. To install a filter, attach it between the donor antenna and the amplifier. Connect the filter to the cable from the donor antenna. Then connect a short two-foot jumper cable to the other side of the filter and attach it to the donor (outside) antenna connection on the booster. Then, using our example above, the filter will attenuate, or reduce in strength, the signal coming in from the offending Verizon tower while allowing the booster to amplify the desired AT&T signal. To decide which filter you need, find out which carrier or carriers will be used by people in the building, and which ones, if any, will not. Then, use a signal meter to determine which frequencies, channels, and bands those carriers are using, and which ones are causing the overload condition. Install the filter that attenuates the offending frequency range. 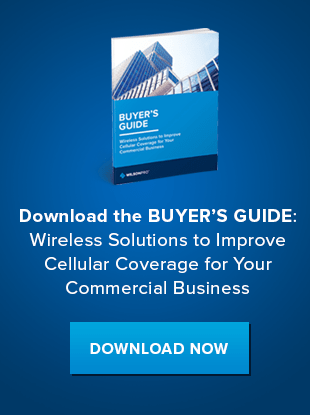 Watch this video to learn more about filters and troubleshooting cell signal booster systems.